We made our way into the auditorium and our seats were exceptional. We were in the second row of permanent seats, close to stage right; very close to Mel Collins and Pat Mastelotto. 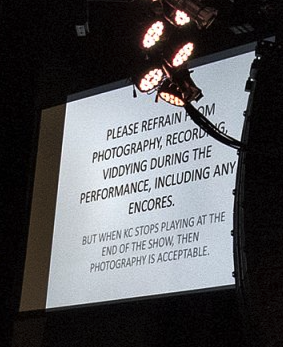 The camera policy, which has been a long-term Fripp bugbear has codified into signs onstage and throughout the venue describing the band’s camera policy. They’ve settled on a fair compromise. Since Tony Levin keeps a road diary full of his photography, KC have deemed that when Levin brings out his camera after the encore than the audience is free to snap away. If this rule is broken, it has been determined that stopping the show and removing the infractor has proven a powerful disincentive for rogue papparazzi. Even so, the show the night prior in Atlanta, in the much more intimate Center Stage [cap. 1,100] resulted in application of this rule. Gulp! In the hour before showtime the Fripp soundscapes filtered into the venue. I think I’ve read somewhere that Fripp records unique soundscapes for the beginning of each show! Any double dippers out there who can verify this? There are many two-night stands on this tour. My wife got her ticket much later so she was sitting in a different part of the floor, but for now she sat with us until the seat she occupied arrived. I had gotten contacted by PPM commenter James Pagan, who lived nearby and he revealed that he was sitting in the row behind me; just a seat to my right, so naturally when he arrived we introduced ourselves and our wives and managed to chat about music and pets for a while. Then the event began. The band walked out to applause all dressed in suits as they took to their stations. The back line was from left to right, Mel Collins [sax/flute], Tony Levin [bass, chapman stick], Chris Gibson [synths], Jakko Jakszyk [vocals/guitar], and Robert Fripp [guitar/synths]. The frontline were three drummers who began playing first. From left to right was Pat Mastelotto [drums/percussion], Jeremy Stacey [drums/synths], and Gavin Harrison [drums]. 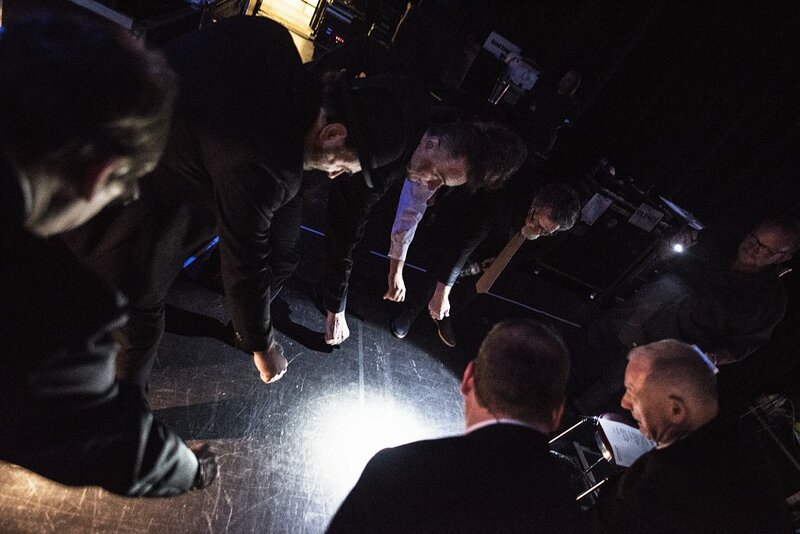 The drummers wove a web of drum improv for a short time until the pealing of metallic percussion heralded the coming of “Lark’s Tongues In Aspic Part I.” The drummers were tickling various glockenspiels and here might have even been a kalimba in there just like on the album. With three drummers, one can indulge in these luxuries. My attention was on Fripp as I could clearly see him playing the serrated “warning claxon” riff that was his entry to the song in advance of the sound engineer fading him up in the mix. It gave me a sense of seeing the storm advance before I heard it. Then it swept through the auditorium like a firestorm as the song dispensed with its deceptively genteel intro to begin the excursion into the paradoxical delicacy of the song which as usual, sat cheek-by-jowel with an onslaught of power and intensity. What my friend Ron calls Crimson’s “punishment/reward” ethos. This evening the song was possessed of a jazzy swagger that this much larger band brought to the proceedings. Now that Robert Fripp has adopted his New Standard Tuning, he is not absolutely replicating his guitar parts. Due to NST, some of those old moves are too awkward to make, so it fell to Jakszyk to lay into the almost bluesy power riff that came from an unexpected quarter with this band. 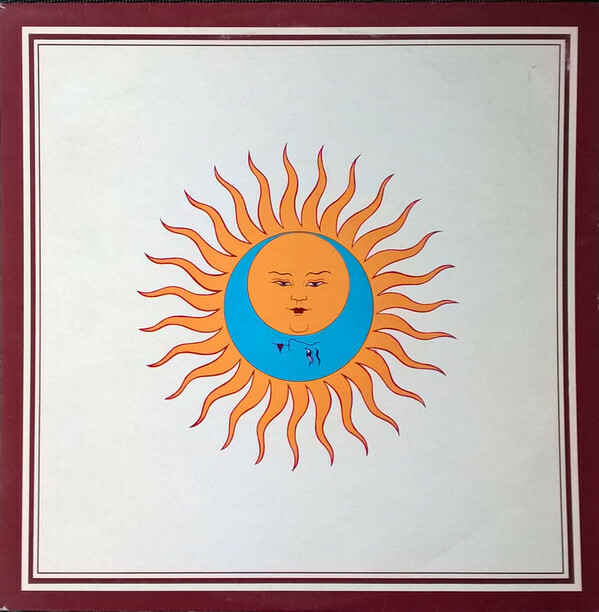 Then while our skulls were beginning to melt, Fripp laid into a high intensity solo over Jakszyk with his characteristic hyperkinetic onslaught. Then the drummers took the baton; propelling the song with roiling waves of breakneck percussive speed until flautist Collins allowed the song to hover majestically and alight on a flower with his delicate and playful flute solo that was given plenty of space to develop before Fripp’s claxon riff circled back for a restatement of the guitar theme as the first song of the evening ultimately relaxed into its delicate, lyrical coda. Shock and awe, yes, but also beauty and wonderment all wrapped up in the first ten minutes of this show unlike any other. It was going to be a thrilling evening. This entry was posted in Concert Review, Core Collection, Your Prog Roots Are Showing and tagged 2017, King Crimson, Live Concerts, Robert Fripp. Bookmark the permalink.